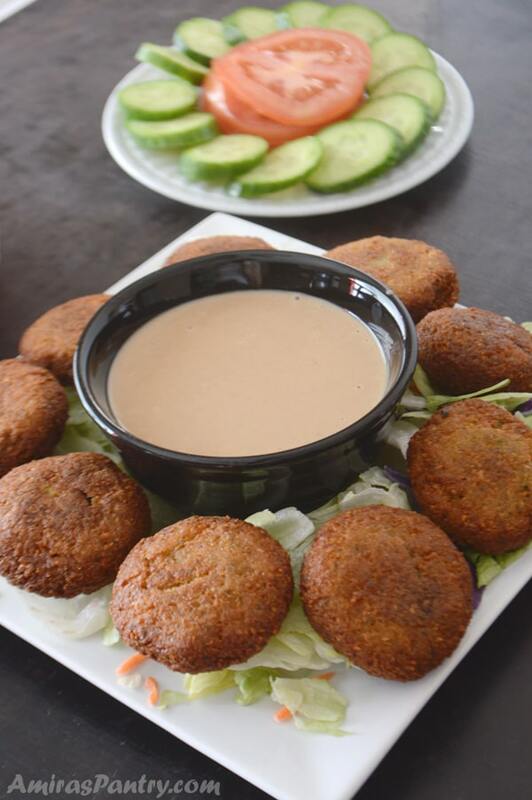 Enjoy crunchy homemade Middle Eastern falafel. Crispy, flavorful and with a twist. Take falafel to the next level with this delicious stuffing. 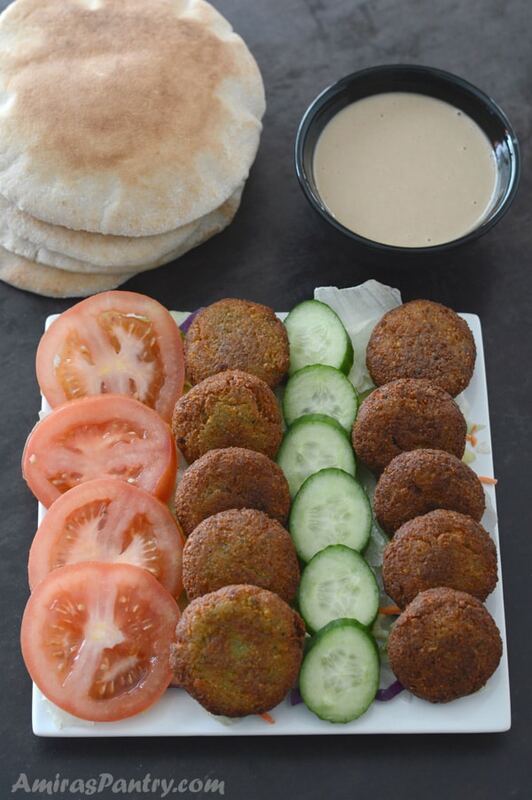 If you ask anyone in the whole world about the most famous Middle Eastern recipe, I guess everyone will say falafel. 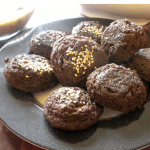 These vegetarian patties are very famous in the whole world, not only the Middle East . In Egypt, there is a falafel restaurant per a couple of streets, no joking here. Not in every neighbourhood but in like every two or three streets. Falafel in Egypt is like Hamburgers in the US :). 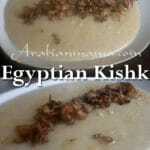 It is the ultimate Egyptian street food as it is affordable tasty and filling. These restaurants not only sell falafel, but also foul, fried eggplants, french fries, green salad, boiled eggs and sometimes egga as well. Also you will definitely find carts for on the go falafel and foul, when you pass by these carts the smell is so tempting. When I was growing up, eating from street carts and vendors was not allowed in my home. My mom feared that these carts are not safe and one can get food poisoned easily. When I was working in downtown Cairo, we used to send the office boy bring us lunch. Once he brought us these magnificent flavorful falafel. They were stuffed in a chewy pita bread (Aish Balady, Egyptian most common type of bread), and topped with all sorts of salad/dressing/pickles. We all were hooked, and he never revealed this secret restaurant that he is buying from. Smart guy, he wanted us always to depend on him for our lunch. One day, I got this thought that he might be buying us these delicious sandwiches from a street cart not a restaurant and that he does not want to tell us so we will not panic. So, I brought my concerns to my colleagues, the funny thing is, they all said DO NOT ASK, let’s just pretend it is from a fancy and very clean restaurant hehehehe. Yes, they were that good that we did not want to jeopardize them :). Now Let’s see how to make this gorgeous stuffed falafel. You’ll need to soak chickpeas overnight, drain then process in the food processor. I personally, prefer to use dry chickpeas and soak them overnight. Some people, out of convenience I believe, like using canned chickpeas. 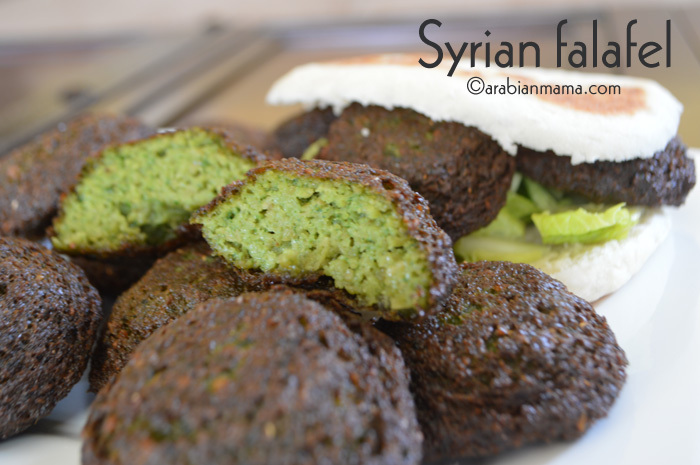 Egyptian falafel is made using soaked fava beans but Syrian falafel, as we call them in Egypt, use chickpeas. So use whatever you can find easily and what appeals to you, some people use a combination of both. 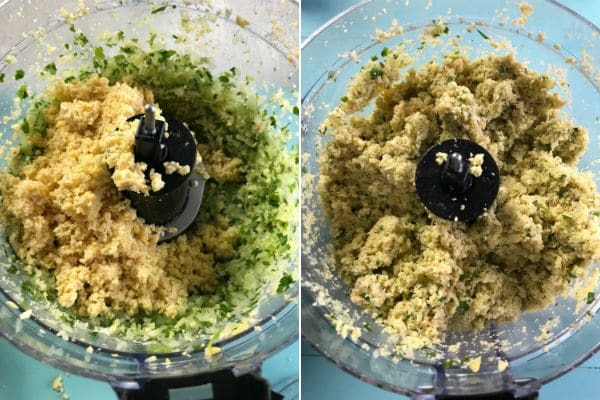 Dump the processed chickpeas in a bowl and in the food processor, add onion, garlic, cilantro and parsley. Puree until they are all mixed and there is no visible big chunks. 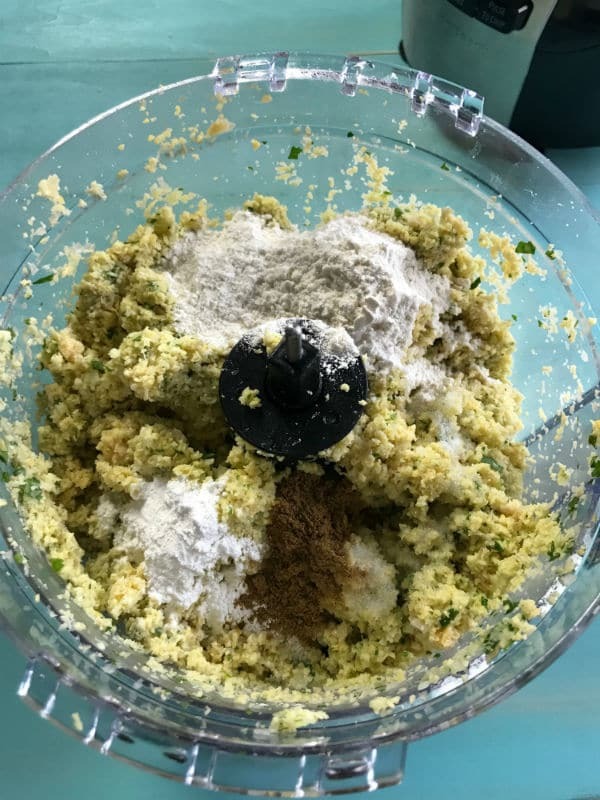 Now gradually add the chickpeas mixture and process until you get a uniform mixture of falafel. I used to put everything together in the food processor at once , the chickpeas and the vegetables. But doing them separately then combining them together is much easier. Add the spices, flour and mix well. 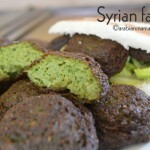 You’ll notice that unlike my other falafel recipes, the mixture here is not as green. Well, that’s because I am using far less fresh herbs than the Egyptian one or the Syrian one I’ve made. I’m used to adding so much herbs, I like it greener than this but because we are going to stuff it, we do not want it to be drier so we can fry them safely without it breaking into pieces in the pan. In a pan over medium heat we will saute onions then turn heat off and let it cool down. When it has cooled add the feta cheese. 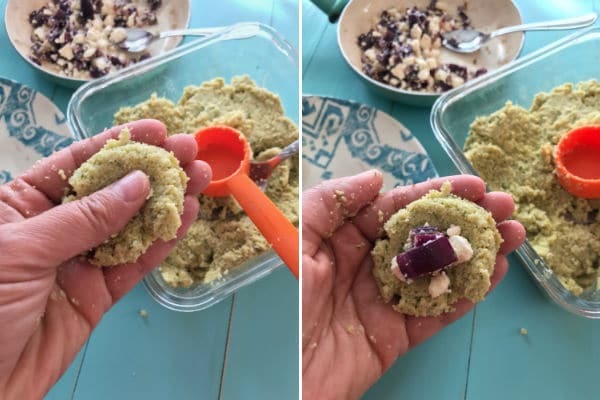 Take a ball of the falafel and stuff it with the onion feta mixture. Do not overstuff it or it will open while frying. Now close the ball on the filling and form into a patty. Fry in hot oil until golden brown, took me about 3 minutes per side. Enjoy it your way or for a truly Egyptian kind of sandwich, stuff it in pita bread with tomato, lettuce, pickles and of course some tahini sauce. When I was a little girl, I slathering my ‘aish balady’, Egyptian pita bread, with white feta cheese top that with falafel, greens and some onion slices. I still like the taste of falafel and feta A LOT. That’s why I decided to stuff my falafel with feta cheese. 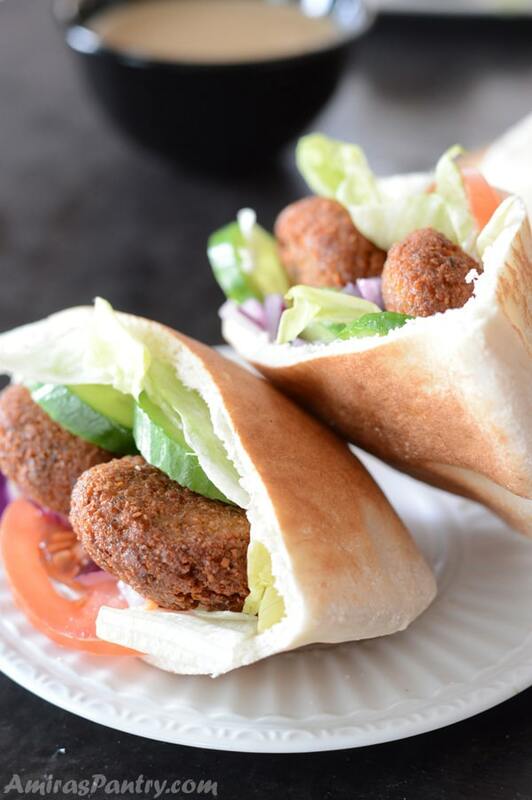 Stuffed falafel is not very common in Egypt, but you might find people elsewhere do it. 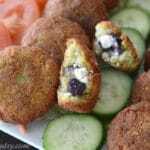 Mostly people stuff falafel with a mixture of red onion and sumac. I’ve seen others stuff it with mozzarella, but seriously I did not feel that mozzarella and falafel are made for eachother. For a super hot variation I might think of stuffing falafel with harissa, or probably a mixture of feta and harissa, who knows :). I did not expect my kids to like it as most of them are very traditional and not very flexible when it comes to food. But for my surprise, they all liked it, ate it and even asked for more!! They never cease to surprise me. 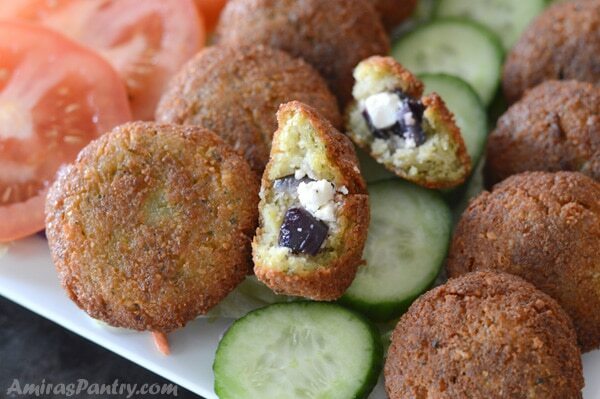 Crispy and flavorful falafel stuffed with a mixture of onion and feta cheese. 1 1/2 cup dried chickpeas. 1/3 cup fresh parsley roughly chopped. 1/3 cup fresh cilantro roughly chopped. 1 1/2 teaspoon salt. or to taste. 1 medium red onion diced. In a large bowl, add chickpeas then add enough water to cover. Let soak overnight. Drain the chickpeas, place in a food processor, puree , work in patches if necessary. 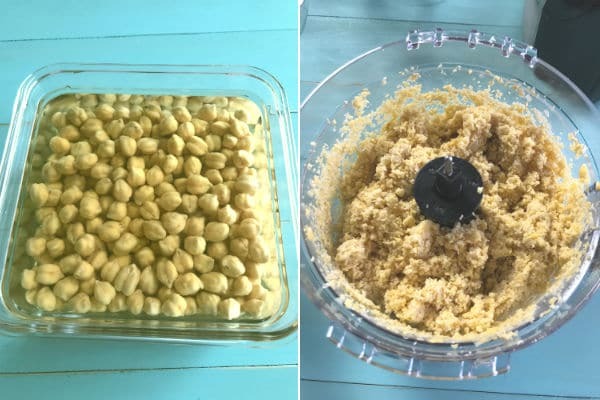 Transfer the processed chickpeas to a bowl. 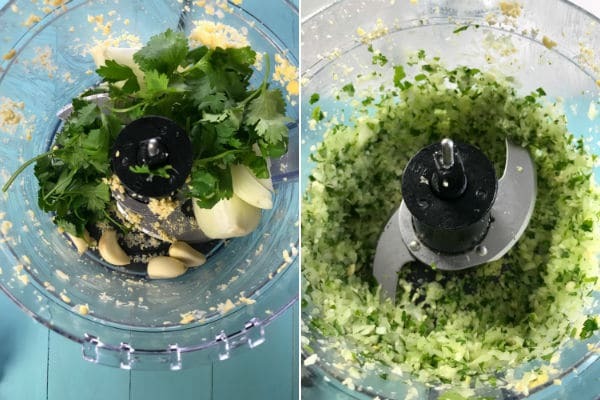 In the food processor, add onions, garlic, parsley and cilantro. While the blade still running add the chickpeas in patched until you are done and everything is well pureed together. Add the salt, flour, baking powder,cumin and process again. Transfer the mixture to a bowl and refrigerate while making the stuffing. In a skillet over medium heat, add oil then sauté onions until fragrant, turn off heat and let it cool for 10 minutes. 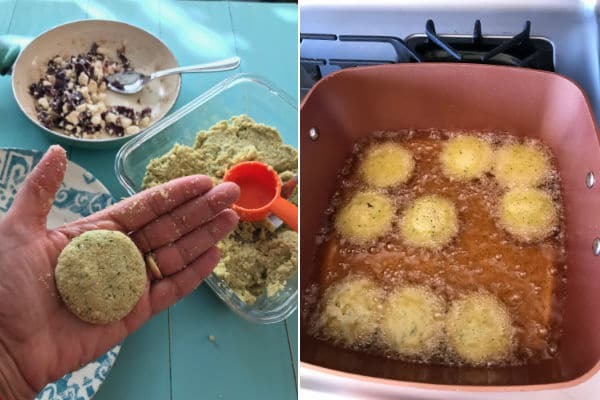 Take about two tablespoons of the chickpea mixture, make a small well in the middle add 1/2-3/4 teaspoon of the feta mixture in the middle then close to form a ball. Press lightly to flatten a bit and form a patty. Work your way until you are done with the while patch. You can freeze the patties at this point for a later use or start frying them. Heat about 2 inched of oil in a frying pan over medium heat, then fry on each side for few minutes ( mine took 3 minutes per side). Enjoy stuffed in pita with tomatoes, onion, green lettuce, cucumber and drizzle with some tahini sauce. I look forward to your weekly emails dropping into my inbox. Being married to an Egyptian, we love Egyptian food and it is hard to get in Scotland. 120 mile round trip every couple of months to stock up on foul, kunafa and stuff I cannot get locally. Your falafel sound good but I always make mine with foul, leeks, garlic, onion,cilantro and badunis. Thing is…..they go in minutes. Lol. Well worth it as nothing compares. Sometimes we stuff them with cheddar, feta or pastrama. Salam Alaykom Maryam. Oh man 120 miles!!!! this must be hard. I have a recipe on my blog for the authentic Egyptian falafel made with foul but I do not use leek, will try basterma stuffing next time. Thank you for your sweet words. 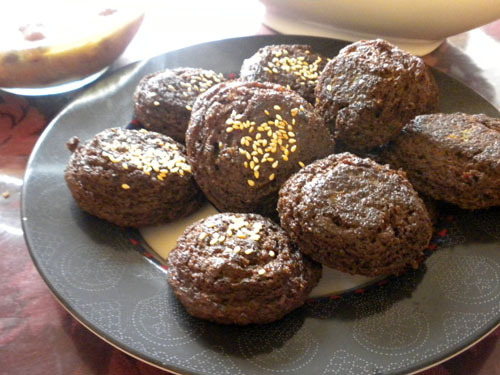 Easy falafel recipe, I made min into patties and baked in muffin tin. Came out perfect, I also reheated leftovers in a pan right before eating. 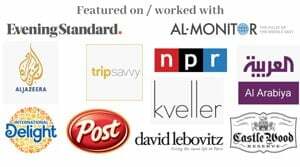 I love falafel and I was just looking for a recipe a couple of days before your post. You must have guessed Amira! And with the feta onion stuffing it ought to be even more delicious. I bet I’ll try these soon. Thanks and have a lovely week.